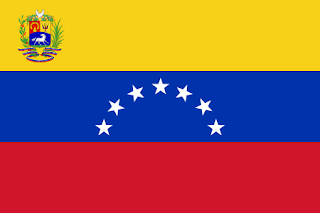 The Venezuelan flag emerged at the beginning of its struggle for independence back in 1811. 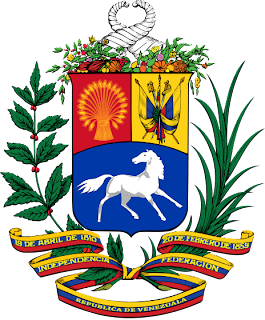 However, it was initially created in 1806 by Francisco de Miranda as he launched the first expedition to free Venezuela. However, this expedition failed. Though his banner served to inspire several other South American nations. His banner was a horizontal tricolour of yellow, blue, and red. The symbolism attached was that the yellow stood for the wealth of the land, blue for the peoples courage, and the red for their lands independence from Spain. 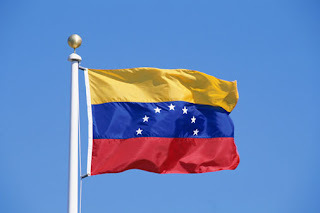 Independence was gained in 1821, and the flag was adopted for the new Venezuela. Then, in 1861, the national government adopted a new flag placing 7 white stars in a hexagon shape in the centre of the blue stripe. Then, in the mid 1900's, the national coat of arms was added to the upper hoist canton. This created a new State flag, with the previous flag remaining as the civil flag. The coat of arms features a shied divided into 3, with each being 1 of the three colours of the flag. The upper left is yellow, with a golden wheat sheaf comprising 20 ears. One for each state in the Republic. On the upper right, in yellow, are weapons, and 2 national flags tied with laurel to represent victory. The bottom, in blue, is a running horse. Representing independence and freedom. Above the shield are 2 Horns of Plenty. Surrounding the shield are 2 branches, one olive, and one palm. They are bound together with a ribbon in the national colours. Then, under the presidency of Hugo Chavez, both flags where altered again. 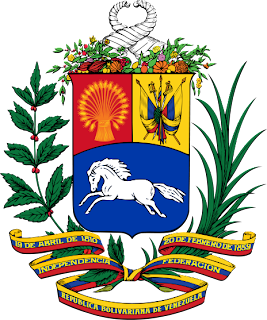 First change affected both civil and state flags, with, what was described as the fulfilment of Bolivars decree, and an 8th star was added to the crescent of stars in the centre of the flag. More controversially, the state coat of arms was altered, with the horse being switched, so that it ran to the left. The official explanation was that the horse now runs, and looks, the same way, running towards independence and freedom. However, its critics have said that it is running left, in line with Chavez' stated political views.